Sooner or later you may encounter a stuck zipper in the most embarrassing of situations. 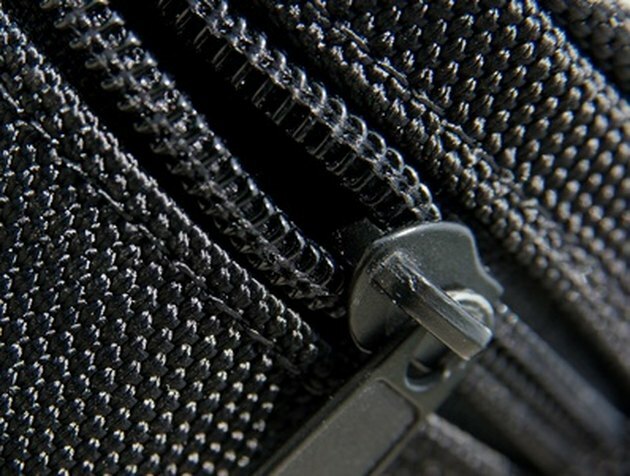 Although it can be irritating, pulling on the zipper in haste may cause it to break or catch a piece of your clothing inside the zipper, which may lead to a partially closed item. There are several ways to fix a zipper so it works easier. Use these methods at the first hint of a problem to prevent future mishaps. Grab the closest bar of soap. Open the zipper and rub the soap on the teeth. Go up and down the teeth about four times to allow the slider to move more easily. Place lip balm on your finger and run it along the teeth of an open zipper. Slather the balm up and down the teeth. The balm allows the slider of the zipper to move up and down the teeth easier. Dip a cotton swab in distilled white vinegar. Allow the vinegar to soak on the teeth of an open zipper for about ten minutes. Move the zipper up and down after the zipper teeth air dry. Sponge a small drop of olive oil on the open zipper's teeth. Rub the oil along the teeth three times allowing the oil to sink into the teeth. Slide the zipper up and down several times to loosen the zipper.